Liberty Enlightening the World (in French: La liberté éclairant le monde), known more commonly as the Statue of Liberty (Statue de la Liberté), is a colossal statue given to the United States by the Paris based Union Franco-Américaine (Franco-American Union) in 1886, standing at Liberty Island, in the mouth of the Hudson River in New York Harbor as a welcome to all visitors, immigrants, and returning Americans. The copper statue, dedicated on October 28, 1886, commemorates the centennial of the United States and is a gesture of friendship between the two nations. The sculptor was Frederic Auguste Bartholdi. Alexandre Gustave Eiffel, the designer of the Eiffel Tower, engineered the internal structure. Eugène Viollet-le-Duc was responsible for the choice of copper in the statue's construction and adoption of the Repoussé technique. The statue depicts a large woman, standing upright, dressed in a flowing robe and a seven point spiked crown representing the Seven Seas, holding a stone tablet close to her body in her left hand and a flaming torch high in her right hand. The statue is made of pure copper on a framework of steel (originally puddled iron) with the exception of the flame of the torch, which is coated in gold leaf. It stands atop a rectangular stonework pedestal, itself on an irregular eleven-pointed star foundation. The statue is 151 feet and one inch tall, with the foundation adding another 154 feet. The tablet contains the text "JULY IV MDCCLXXVI" (July 4, 1776) commemorating the date of the United States Declaration of Independence. The interior of the pedestal contains a bronze plaque inscribed with the poem "The New Colossus" by Emma Lazarus. (It has never been engraved on the exterior of the pedestal, despite such depictions in editorial cartoons). Worldwide, the Statue of Liberty is one of the most recognizable icons of the United States, and, in a more general sense, represents liberty and escape from oppression. The Statue of Liberty was, from 1886 until the jet age, often one of the first glimpses of the United States for millions of immigrants after ocean voyages from Europe. In terms of visual impact, the Statue of Liberty appears to draw inspiration from il Sancarlone or the Colossus of Rhodes. The statue is a central part of Statue of Liberty National Monument and is administered by the National Park Service. The Statue of Liberty was one of the earliest beneficiaries of a cause marketing campaign. A 1983 promotion advertised that for each purchase made with an American Express card, American Express would contribute one penny to the renovation of the statue. The campaign generated contributions of $1.7 million to the Statute of Liberty restoration project. In 1984, the statue was closed so that a $62 million renovation could be performed for the statue's centennial. Chrysler chairman Lee Iacocca was appointed by President Reagan to head the commission overseeing the task (but was later dismissed "to avoid any question of conflict" of interest). Workers erected scaffolding around the statue, obscuring it from public view until the rededication on July 4, 1986 - the scaffolding-clad statue can be seen in the 1984 film Desperately Seeking Susan. Inside work began with workers using liquid nitrogen to remove seven layers of paint applied to the interior of the copper skin over the decades. That left two layers of tar originally applied to plug leaks and prevent corrosion. Blasting with baking soda removed the tar without further damaging the copper. Larger holes in the copper skin had edges smoothed then mated with new copper patches. Each of the 1,350 shaped iron ribs backing the skin had to be removed and replaced. The iron had experienced galvanic corrosion wherever it contacted the copper skin, losing up to 50% of its thickness. Bartholdi had anticipated the problem and used an asbestos/pitch combination to separate the metals, but the insulation had worn away decades before. New bars of stainless steel bent into matching shapes replaced the iron bars, with Teflon film separating them from the skin for further insulation and friction reduction. Liquid nitrogen was again introduced to parts of the copper skin in a cryogenics process which was treated by a (now defunct) Michigan company called CryoTech to ensure certain individual parts of the statue were strengthened and would last longer after installation. The internal structure of the upraised right arm was reworked. The statue was erected with the arm offset 18" to the right and forward of Eiffel's central frame, while the head was offset 24" to the left, which compromised the framework. Theory held that Bartholdi made the modification without Eiffel's involvement after seeing the arm and head were too close. Engineers considered reinforcements made in 1932 insufficient and added diagonal bracing in 1984 and 1986 to make the arm structurally sound. Historical records make no mention of the source of the copper used in the Statue of Liberty. In the village of Visnes in the municipality of Karmøy, on the western coast of Norway, tradition holds that the copper came from the French-owned Visnes Mine. Ore from this mine, refined in France and Belgium, was a significant source of European copper in the late nineteenth century. It is probable that few projects before or since the Statue`s construction in 1876-1885 ever required as much copper. The first copper at Visnes was discovered in 1865, and the mine constructed under the direction of Charles Defrance, a French mining engineer. Defrance was employed by a mining company in Antwerp, Belgium. This same company owned ore processing plants in France and Belgium and a refinery near Antwerp, in Hemixen, Belgium. In 1894, the copper mine in Visnes closed, and the town disappeared. 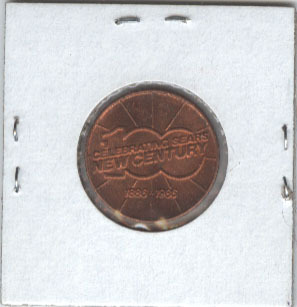 In 1985, Bell Laboratories used emission spectrography to compare samples of copper from the Visnes Mines and from the Statue of Liberty, found the spectrum of impurities to be very similar, and concluded that the evidence argued strongly for a Norwegian origin of the copper. Other sources say that the copper was mined in Nizhniy Tagil, a city to the north of Yekaterinburg in Russia. This medallion was crafted from authentic materials from the Statue of Liberty - Ellis Island National Monument. These valuable materials were made available by the Statue of Liberty - Ellis Island Foundation (SL/EIF), in 1982 to be ready by the statue's centennial in 1986. One side features the face of the statues, and reads: and the other side reads:: "CONTAINS AUTHENTIC MATERIAL - LIBERTY CENTENNIAL 1886 - 1986 - ©1982 SL/EIF, INC." while the reverse reads "CELEBRATING SEARS NEW CENTURY 1886 - 1986" inside of a decorative '100'. The size of the medallion is slightly larger than a nickel, and the condition and patina of every medallion will vary. 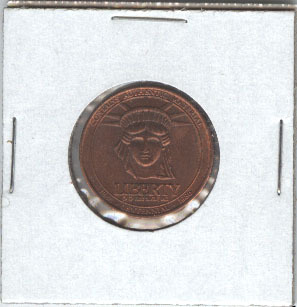 Each medallion is sent in a cardboard / mylar sleeve to protect the coin, as well as leaves the medal visible to the viewer.